Content from the upcoming book Share This Too will get an inaugural outing in Newcastle this Wednesday at the CIPR Northern Conference, and then in July at a day-long Share This Live conference at Microsoft’s headquarters in London. In Newcastle we’re running two panel sessions with contributors sharing their content from the book, alongside speakers including Brian Cathcart, Director, Hacked Off; Margaret Aspinall, Chair, Hillsborough Family Support Group; David Payne, Never Seconds; and John McAndrew, Executive Editor, Sky News, amongst others. In a post-Leveson world where the traditional media is on the back foot and social media is everywhere and all seeing, we’ll explore the opportunities and challenges for professional communicators. The event is aimed at practitioners based in the north of England. Tickets are available online. 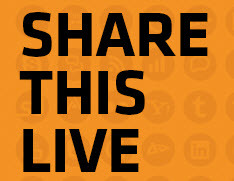 At Share This Live in London on 11 July, keynote speakers Tom Standage, Digital Editor, The Economist, and Nick Jones, Vice President Corporate Communications - Digital, Visa Europe, will bookend sessions led by Share This Too contributors. Each session will focus on a different area of social media practice with insights from brands including The Guardian, Adobe, Microsoft, The Embassy of Japan, Chicago Mercantile Exchange and Confused.com, among others. Share This Live is aimed at practitioners that are looking to both improve and build upon their existing social media and digital skills. Tickets are available online. The book itself remains a work in progress. More than 30 contributors are putting the finishing touches to their proofs ahead of publication in September. Rob Brown and I are editing Share This Too. It’s is a follow-up to Share This. Both books have been developed by the CIPR Social Media Panel. The first book featured more than 20 contributors and has become a best-selling handbook for professional practice. Share This is split into 26 chapters over eight topic areas covering the media and public relations industry, planning, social networks, online media relations, monitoring and measurement, skills, industry change and the future of the industry. Share This Too moves the topic on. It builds on the themes in the first book, probing deeply into what is current in the theory, delivery and evaluation of 21st century public relations and organisational communication. I’m delighted to be contributing to the Northern Conference on home ground as a panellist and will be chairing Share This Live. I hope that you’re able to join us and if not, we’re working on other events around the UK, and overseas that we’ll announce in due course.